Are you brand new to sudoku? Perhaps you are introducing a child to the joy of solving sudoku for the first time, and want some nice, small puzzles to introduce the concept and how the puzzles work. If so, then this book of 4x4 beginners sudoku will be perfect. With the small grids with just a few numbers to place, the puzzles perfectly introduce how to solve sudoku, without requiring a lot of time or grid searching, so they are perfect for those whose attention span is not yet at the adult level. Build up confidence at sudoku solving by starting with these small puzzles, then moving up to larger grids once these have all been mastered. For beginners to sudoku these puzzles are a great way to get bitten by the sudoku bug without getting intimidated by the larger grids, but still providing the satisfaction that comes with solving sudoku puzzles. All puzzles require very nothing more than simple logical rules to solve, and have a single solution that can be reached without guessing. 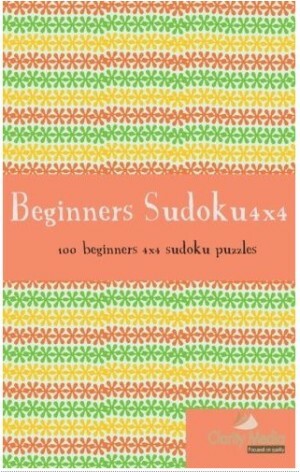 So if you're looking for a first sudoku book, then beginners 4x4 sudoku book should fit the bill. Buy 4x4 Sudoku from Amazon (UK) for £4.50. 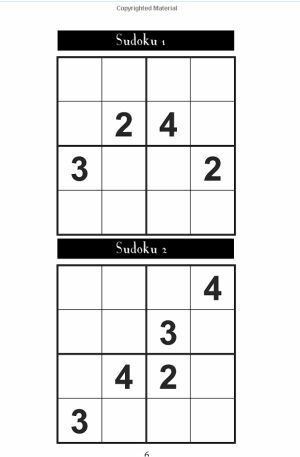 Let's work through how to solve the puzzle shown to the right titled 'Sudoku 2' (the bottom puzzle). How do we solve it? Well, look at the first square in the third row. It must contain 1, because 2,3,4 already appear in the row / box shared by that square. Now the final square in that row must contain 3, that is because it is the only option left. Thus the square beneath that contains 1, the square to its left has 4. You can now write in the remaining numbers as there is only one option left in each case. It's easy, isn't it! Once you've got the hang of the 4x puzzles you'll probably want to move onto something a bit trickier, like the 6x6 or 9x9 puzzle books - the good news is that we have lots of options for you on site, so as you get better and more confident at solving sudoku over time, then there are puzzles that will continue to challenge you no matter what your sudoku solving levels. But for the moment, we hope you enjoy this collection of 100 mini 4x4 sudoku puzzles. Let us know how you got on solving them and if you have any thoughts on other introductory sudoku books that you'd like to see, then of course we would love to hear from you!